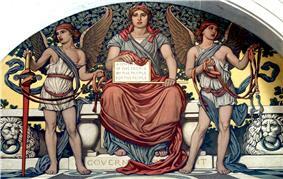 Social Security debate · "Starve the beast"
Fiscal Year 2013 U.S. Federal Spending – Cash or Budget Basis. Fiscal Year 2013 U.S. Federal Receipts. The Budget of the United States Government often begins as the President's proposal to the U.S. Congress which recommends funding levels for the next fiscal year, beginning October 1. However, Congress is the body required by law to pass appropriations annually and to submit funding bills passed by both houses to the President for signature. Congressional decisions are governed by rules and legislation regarding the federal budget process. Budget committees set spending limits for the House and Senate committees and for Appropriations subcommittees, which then approve individual appropriations bills to allocate funding to various federal programs. If Congress fails to pass an annual budget, a series of Appropriations bills must be passed as "stop gap" measures. After Congress approves an appropriations bill, it is sent to the President, who may sign it into law, or may veto it (as he would a budget when passed by the Congress). A vetoed bill is sent back to Congress, which can pass it into law with a two-thirds majority in each chamber. Congress may also combine all or some appropriations bills into an omnibus reconciliation bill. In addition, the president may request and the Congress may pass supplemental appropriations bills or emergency supplemental appropriations bills. 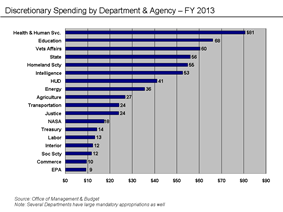 Several government agencies provide budget data and analysis. These include the Government Accountability Office (GAO), Congressional Budget Office, the Office of Management and Budget (OMB) and the U.S. Treasury Department. These agencies have reported that the federal government is facing a series of important long-run financing challenges, primarily driven by an aging population and spending for healthcare programs such as Medicare and Medicaid. In the short-term, the annual deficit returned to its historical average relative to the size of the economy in fiscal year 2014 (around 3% GDP) and is projected to remain around that level until 2019 before slowly rising. The U.S. Constitution (Article I, section 9, clause 7) states that "No money shall be drawn from the Treasury, but in Consequence of Appropriations made by Law; and a regular Statement and Account of Receipts and Expenditures of all public Money shall be published from time to time." Each year, the President of the United States submits his budget request to Congress for the following fiscal year as required by the Budget and Accounting Act of 1921. Current law (31 U.S.C. § 1105(a)) requires the president to submit a budget no earlier than the first Monday in January, and no later than the first Monday in February. Typically, presidents submit budgets on the first Monday in February. The budget submission has been delayed, however, in some new presidents' first year when the previous president belonged to a different party. The federal budget is calculated largely on a cash basis. That is, revenues and outlays are recognized when transactions are made. Therefore, the full long-term costs of entitlement programs such as Medicare, Social Security, and the federal portion of Medicaid are not reflected in the federal budget. By contrast, many businesses and some other national governments have adopted forms of accrual accounting, which recognizes obligations and revenues when they are incurred. The costs of some federal credit and loan programs, according to provisions of the Federal Credit Reform Act of 1990, are calculated on a net present value basis. Federal agencies cannot spend money unless funds are authorized and appropriated. Typically, separate Congressional committees have jurisdiction over authorization and appropriations. The House and Senate Appropriations Committees currently have 12 subcommittees, which are responsible for drafting the 12 regular appropriations bills that determine amounts of discretionary spending for various federal programs. Appropriations bills must pass both the House and Senate and then be signed by the president in order to give federal agencies the legal budget authority to spend. In many recent years, regular appropriations bills have been combined into "omnibus" bills. Congress may also pass "special" or "emergency" appropriations. Spending that is deemed an "emergency" is exempt from certain Congressional budget enforcement rules. Funds for disaster relief have sometimes come from supplemental appropriations, such as after Hurricane Katrina. In other cases, funds included in emergency supplemental appropriations bills support activities not obviously related to actual emergencies, such as parts of the 2000 Census of Population and Housing. Special appropriations have been used to fund most of the costs of war and occupation in Iraq and Afghanistan so far. Budget resolutions and appropriations bills, which reflect spending priorities of Congress, will usually differ from funding levels in the president's budget. The president, however, retains substantial influence over the budget process through his veto power and through his congressional allies when his party has a majority in Congress. The amount of budget authority and outlays for a fiscal year usually differ because the government can incur obligations for future years. This means that budget authority from a previous fiscal year can, in many cases, be used for expenditure of funds in future fiscal years; for example, a multi-year contract. Budget authority is the legal authority provided by federal law to enter into financial obligations that will result in immediate or future outlays involving federal government funds. Outlays refer to the issuance of checks, disbursement of cash or electronic transfer of funds made to liquidate a federal obligation and is usually synonymous with "expenditure" or "spending." The term "appropriations" refers to budget authority to incur obligations and to make payments from the Treasury for specified purposes. Some military and some housing programs have multi-year appropriations, in which their budget authority is specified for several coming fiscal years. In the congressional budgeting process, an "authorization" (technically the "authorization act") provides the legal authority for the executive branch to act, establishes an account which can receive money to implement the action, and sets a limit on how much money may be expended. However, this account remains empty until Congress approves an "appropriation", which requires the U.S. Treasury to provide funds (up to the limit provided for in the authorization). Congress is not required to appropriate as much money as is authorized. Congress may both authorize and appropriate in the same bill. Known as "authorization bills", such legislation usually provides for a multi-year authorization and appropriation. Authorization bills are particularly useful when funding entitlement programs (benefits which federal law says an individual has a right to, regardless if any money is appropriated), where estimating the amount of funds to be spent is difficult. Authorization bills are also useful when giving a federal agency the right to borrow money, sign contracts, or provide loan guarantees. In 2007, two-thirds of all federal spending came through authorization bills. A "backdoor authorization" occurs when an appropriation is made and an agency required to spend the money even when no authorizing legislation has been enacted. A "backdoor appropriation" occurs when authorizing legislation requires an agency to spend a specific amount of money on a specific project within a specific period of time. Because the agency would be violating the law if it did not do so, it is required to spend the money — even if no appropriation has been made. Backdoor appropriations are particularly vexsome because removing the appropriate requires amending federal law, which is often politically impossible to do within a short period of time. Backdoor authorizations and appropriations are sources of significant friction in Congress. Authorization and appropriations committees jealously guard their legislative rights, and the congressional budgeting process can break down when committees overstep their boundaries and are retaliated against. The Heritage Foundation's "Budget Chart Book"
Budget of the United States Government and various supplements from 1923 to the present. Federal Budget Receipts and Outlays from 1930 to the present. ^ A bill can also be enacted by a Congressional override of a presidential veto, or is automatically enacted if the president takes no action within 10 days after receiving the bill. ^ Heniff, Bill and Keith, Robert. The Federal Budget Process. Alexandria, Va.: Capitol.Net, 2009, p. 10—27. ^ Dewhirst, Robert E. and Rausch, John David. "Authorization Bills." In Encyclopedia of the United States Congress. New York: Facts On File, 2007, p. 27. ^ Milakovich, Michael E. and Gordon, George J. Public Administration in America. Boston: Wadsworth Cengage Learning, 2013, p. 348-349. ^ Bernanke, Ben S. (April 27, 2010). "Speech before the National Commission on Fiscal Responsibility and Reform: Achieving fiscal sustainability". Federalreserve.gov. Retrieved February 2, 2011. ^ Hamby, Alonzo (2011-07-29). "Presidents and Their Debts, F.D.R. to Bush". ^ "The rise of the anti-Keynesians". ^ "A dirty secret lurks in the struggle over the Grand Bargain". ^ "Where Does our National Debt Come From?". Office of Management and Budget. Retrieved May 25, 2012. ^ Bittle, Scott (2011). Where Does the Money Go?. Harper. ^ Ted Barrett (May 16, 2012). "Senate's all-day budget debate dominated by politics". CNN. Retrieved May 21, 2012. ^ Brian Faler (May 16, 2012). "Senate Rejects Five Budget Plans Amid Republican Complaints". Bloomberg. Retrieved May 21, 2012. ^ Ed Feulner (May 14, 2012). "Senate’s Lee offers proposal that would save the American Dream". The Washington Times. Retrieved May 21, 2012. ^ Media report-- OMB data not yet available. Actual budget data for prior years is available from the Congressional Budget Office; see the "Historical Budget Data" links on the main page of the "The Budget and Economic Outlook." and from the Office of Management and Budget (OMB). The President's budget also contains revenue and spending projections for the current fiscal year, the coming fiscal years, as well as several future fiscal years. In recent years, the President's budget contained projections five years into the future. The Congressional Budget Office (CBO) issues a "Budget and Economic Outlook" each January and an analysis of the President's budget each March. CBO also issues an updated budget and economic outlook in August. The budget year runs from October 1 to September 30 the following year and is submitted by the President to Congress prior to October for the following year. In this way the budget of 2013 is submitted before the end of September 2012. This means that the budget of 2001 was submitted by Bill Clinton and was in force during most of George W. Bush's first year in office. The budget submitted by George W. Bush in his last year in office was the budget of 2009, which was in force through most of Barack Obama's first year in office. Annual U.S. spending 1930-2014 alongside U.S. GDP for comparison. IMF managing director Christine Lagarde wrote in August 2011: "For the advanced economies, there is an unmistakable need to restore fiscal sustainability through credible consolidation [deficit reduction] plans. At the same time we know that slamming on the brakes too quickly will hurt the recovery and worsen job prospects. So fiscal adjustment must resolve the conundrum of being neither too fast nor too slow. Shaping a Goldilocks fiscal consolidation is all about timing. What is needed is a dual focus on medium-term consolidation and short-term support for growth and jobs. That may sound contradictory, but the two are mutually reinforcing. Decisions on future consolidation, tackling the issues that will bring sustained fiscal improvement, create space in the near term for policies that support growth and jobs." However, experts after the 2008-2009 U.S. recession argued that longer-term austerity measures should not interfere with measures to address the short-term economic challenges of high unemployment and slow growth. Ben Bernanke wrote in September 2011: "...the two goals--achieving fiscal sustainability, which is the result of responsible policies set in place for the longer term, and avoiding creation of fiscal headwinds for the recovery--are not incompatible. Acting now to put in place a credible plan for reducing future deficits over the long term, while being attentive to the implications of fiscal choices for the recovery in the near term, can help serve both objectives." There is significant debate regarding the urgency of addressing the short-term and long-term budget challenges. Prior to the 2008-2009 U.S. recession, experts argued for steps to be put in place immediately to address an unsustainable trajectory of federal deficits. For example, Fed Chair Ben Bernanke stated in January 2007: "The longer we wait, the more severe, the more draconian, the more difficult the objectives are going to be. I think the right time to start was about 10 years ago." The Peter G. Peterson Foundation solicited proposals from six organizations, which included the American Enterprise Institute, the Bipartisan Policy Center, the Center for American Progress, the Economic Policy Institute, The Heritage Foundation, and the Roosevelt Institute Campus Network. The recommendations of each group were reported in May 2011. The Bipartisan Policy Center (BPC) sponsored a Debt Reduction Task Force, co-chaired by Pete V. Domenici and Alice M. Rivlin. The Domenici-Rivlin panel created a report called "Restoring America's Future," which was published in November 2010. The plan claimed to stabilize the debt to GDP ratio at 60%, with up to $6 trillion in debt avoidance over the 2011-2020 period. Specific plan elements included defense and non-defense spending freezes for 4–5 years, income tax reform, elimination of tax expenditures, and a national sales tax or value-added tax (VAT). The Hamilton Project published a guidebook with 15 different proposals from various policy and budget experts in February, 2013. The authors were asked to provide pragmatic, evidenced-based proposals that would both reduce the deficit and bring broader economic benefits. Proposals included a value added tax and reductions to tax expenditures, among others. The House of Representatives Committee on the Budget, chaired by Rep. Paul Ryan (R), released The Path to Prosperity: Restoring America's Promise and a 2012 budget. The Path focuses on tax reform (lowering income tax rates and reducing tax expenditures or loopholes); spending cuts and controls; and redesign of the Medicare and Medicaid programs. 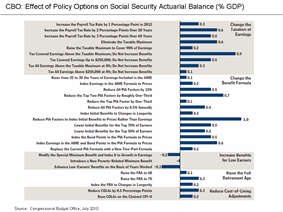 It does not propose significant changes to Social Security. The Bipartisan Policy Center (BPC) evaluated the 2012 Republican budget proposal, noting it had the lowest spending and tax revenue relative to GDP among several alternatives. The Congressional Progressive Caucus (CPC) proposed "The People's Budget" in April 2011, which it claimed would balance the budget by 2021 while maintaining debt as a % GDP under 65%. It proposed reversing most of the Bush tax cuts; higher income tax rates on the wealthy and restoring the estate tax, investing in a jobs program, and reducing defense spending. The BPC evaluated the proposal, noting it had both the highest spending and tax revenue relative to GDP among several alternatives. The CPC also proposed a 2014 budget called "Back to Work." It included short-term stimulus, defense spending cuts, and tax increases. Congressmen Jim Cooper (D-TN) and Steven LaTourette (R-OH) proposed a budget in the House of Representatives in March 2012. While it did not pass the House, it received bi-partisan support, with 17 votes in favor from each party. According to the BPC: "...the plan would enact tax reform by lowering both the corporate and individual income tax rates and raising revenue by broadening the base. 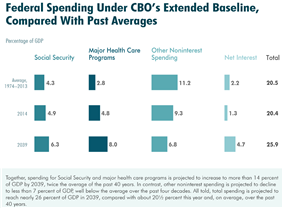 Policies are endorsed that improve the health of the Social Security program, restrain health care cost growth, control annually appropriated spending, and make cuts to other entitlement programs." The plan proposes to raise approximately $1 trillion less revenue over the 2013-2022 decade than the Simpson-Bowles and Domenici-Rivlin plans, while cutting non-defense discretionary spending more deeply and reducing the defense spending cuts mandated in the Budget Control Act of 2011. According to the Center on Budget and Policy Priorities, this plan is ideologically to the Right of either the Simpson-Bowles or Domenici-Rivlin plans. In May 2012, House Republicans put forward five separate budget proposals for a vote in the Senate. The Republican proposals included the House-approved proposal by House Budget Chairman Paul Ryan and one that was very close in content to the budget proposal submitted earlier in 2012 by President Barack Obama. The other three proposals each called for greatly reduced government spending. The budget put forward by Senator Mike Lee would halve the government over the next 25 years. Senator Rand Paul's budget included proposed cuts to Medicare, Social Security benefits and the closure of four Cabinet departments. The budget plan from Senator Patrick Toomey aimed to balance the budget within eight years. All five of the proposed plans were rejected in the Senate. President Obama proposed during July 2012 allowing the Bush tax cuts to expire for individual taxpayers earning over $200,000 and couples earning over $250,000, which represents the top 2% of income earners. Reverting to Clinton-era tax rates for these taxpayers would mean increases in the top rates to 36% and 39.6% from 33% and 35%. This would raise approximately $850 billion in revenue over a decade. It would also mean raising the tax rate on investment income, which is highly concentrated among the wealthy, to 20% from 15%. President Obama established a budget reform commission, the National Commission on Fiscal Responsibility and Reform which released a draft report in December 2010. The proposal is sometimes called the "Bowles-Simpson" plan after the co-chairs of the Commission. It included various tax and spending adjustments to bring long-run government tax revenue and spending into line at approximately 21% of GDP, with $4 trillion debt avoidance over 10 years. Under 2011 policies, the national debt would increase approximately $10 trillion over the 2012-2021 period, so this $4 trillion avoidance reduces the projected debt increase to $6 trillion. The Center on Budget and Policy Priorities analyzed the plan and compared it to other plans in October 2012. A variety of government task forces, expert panels, private institutions, politicians, and journalists have made recommendations for reducing the deficit and slowing the growth of debt. Several organizations have compared the future impact of these plans on the deficit, debt, and economy. One helpful way of measuring the impact of the plans is to compare them in terms of revenue and expense as a percentage of GDP over time, in total and by category. This helps illustrate how the different plan authors have prioritized particular elements of the budget. President Barack Obama stated in June 2012: "What I’ve said is, let’s make long-term spending cuts; let’s initiate long-term reforms; let’s reduce our health care spending; let’s make sure that we’ve got a pathway, a glide-path to fiscal responsibility, but at the same time, let’s not under-invest in the things that we need to do right now to grow. And that recipe of short-term investments in growth and jobs with a long-term path of fiscal responsibility is the right approach to take for, I think, not only the United States but also for Europe." During June 2012, Federal Reserve Chair Ben Bernanke recommended three objectives for fiscal policy: 1) Take steps to put the federal budget on a sustainable fiscal path; 2) Avoid unnecessarily impeding the ongoing economic recovery; and 3) Design tax policies and spending programs to promote a stronger economy. Substantially reduce the role of the rest of the federal government relative to the size of the economy." There are a variety of proposed strategies for reducing the federal deficit. These may include policy choices regarding taxation and spending, along with policies designed to increase economic growth and reduce unemployment. For example, a fast-growing economy offers the win-win outcome of a larger proverbial economic pie, with higher employment and tax revenues, lower safety net spending and a lower debt-to-GDP ratio. However, most other strategies represent a tradeoff scenario in which money or benefits are taken from some and given to others. Spending can be reduced from current levels, frozen, or the rate of future spending increases reduced. Budgetary rules can also be implemented to manage spending. Some changes can take place today, while others can phase in over time. Although a still-weak economy limits the scope for large adjustments immediately, addressing the long-term imbalance soon will allow for more reasonable and gradual adjustments. Tax revenues can be raised in a variety of ways, by raising tax rates, the scope of what is taxed, or eliminating deductions and exemptions ("tax expenditures"). Regulatory uncertainty or barriers can be reduced, as these may cause businesses to postpone investment and hiring decisions. The U.S. federal budget has been criticized for spending on research and action on harm reduction out of proportion to the magnitude of the underlying threats. For example, heart disease, cancer, strokes, respiratory diseases, diabetes, and Alzheimer's disease claimed about 1,650,000 American lives in 2007, when the government spent about $9.6 billion researching ways to alleviate those illnesses. In contrast, terrorism had claimed about 300 lives per year on average over the previous decade, but $150 billion was spent to prevent terrorism, not including even more costly defense and war expenses. However, a major terrorist attack could cause substantial economic disruption. The September 11, 2001 attacks killed almost 3000 people, but caused extensive economic disruption including about $40 billion in insurance losses, a stock market drop which took months to recover, about $15 billion in assistance to airlines, substantial tourism losses, and 430,000 lost jobs amounting to $2.8 billion in lost wages over the three months following. CBO estimates that PPACA includes reductions in Medicare of over $700 billion during the 2013-2022 period, mainly through slightly reducing the trajectory of spending increases expected prior to PPACA. Individual beneficiaries are not directly impacted; most of the cost savings comes from reducing future payments to hospitals and other service providers relative to previous baseline estimates. In other words, PPACA "bends the curve" on Medicare costs down somewhat. Further, since PPACA reduces Medicare payouts, the position of the Medicare Hospital Insurance (HI) Trust Fund is significantly improved. PPACA extended the life of the Medicare HI Trust Fund by 8 years and reduced the 75-year annual shortfall from 3.88% of the U.S. payroll tax base to 1.35%. CBO estimated in March 2011 that the Patient Protection and Affordable Care Act (PPACA), the controversial healthcare legislation passed in 2010 also known as "Obamacare," is expected to reduce the deficit $210 billion total between 2012-2021, with revenues of $813 billion partially offset by outlays of $604 billion. CBO updated its estimate in July 2012, indicating a repeal of PPACA would add $109 billion to the deficit between 2013-2022. Economist Martin Wolf explained in July 2012 that when the U.S. economy has a foreign financial surplus (due to its trade deficit) and a private sector financial surplus (because household savings exceeds business investment), the government must run a budget deficit. This is a rule that holds true by definition. He wrote: "The idea that the huge fiscal deficits of recent years have been the result of decisions taken by the current administration is nonsense. No fiscal policy changes explain the collapse into massive fiscal deficit between 2007 and 2009, because there was none of any importance. The collapse is explained by the massive shift of the private sector from financial deficit into surplus or, in other words, from boom to bust." Economist Paul Krugman also explained in December 2011 the significant shift in the private sector from deficit to surplus. Several other sources have used CBO data to summarize the results in various ways. In June 2012, CBO summarized the cause of change between its January 2001 estimate of a $5.6 trillion cumulative surplus between 2002 and 2011 and the actual $6.1 trillion cumulative deficit that occurred, an unfavorable "turnaround" or debt increase of $11.7 trillion. Tax cuts and slower-than-expected growth reduced revenues by $6.1 trillion and spending was $5.6 trillion higher. Of this total, the CBO attributes 72% to legislated tax cuts and spending increases and 27% to economic and technical factors. Of the latter, 56% occurred from 2009 to 2011. Economist Paul Krugman summarized the causes of increasing deficits and debt in May 2011: "What happened to the budget surplus the federal government had in 2000? The answer is, three main things. First, there were the Bush tax cuts, which added roughly $2 trillion to the national debt over the last decade. Second, there were the wars in Iraq and Afghanistan, which added an additional $1.1 trillion or so. And third was the Great Recession, which led both to a collapse in revenue and to a sharp rise in spending on unemployment insurance and other safety-net programs." The U.S. last balanced its budget in 2001, with a 1.3% GDP surplus. Between 2001 and 2012, spending increased by 4.5% GDP (from 18.2% GDP in 2001 to 22.7% GDP in 2012), while revenues declined by 3.7% GDP (from 19.5% GDP in 2001 to 15.8% GDP in 2012), resulting in a 7.0% GDP deficit for 2012. Medicare/Medicaid spending increased by 1.6% GDP and defense spending increased by 1.3% GDP from 2001 to 2012. Individual income tax revenues fell by 2.4% GDP and payroll taxes fell by 1.4% GDP from 2001 to 2012. Cause of change between CBO's 2001 projection of a $5.6 trillion surplus between 2002-2012 and the $6.1 trillion debt increase that actually occurred. The significant impact of the multiple tax cut expirations and spending reductions that take effect at the end of calendar year 2012 were referred to as the "fiscal cliff." The CBO estimated in May 2012 that allowing current law to take effect would reduce the deficit by a net $560 billion in 2013, roughly half the $1.2 trillion 2011 deficit. Real GDP growth in 2013 would be reduced to 0.5% versus 1.1%, with a high probability of recession during the first half of the year (a 1.3% GDP contraction) followed by 2.3% growth in the second half. Over the long-run, lower deficits and debt support relatively higher growth estimates, however. The fiscal cliff was addressed by the American Taxpayer Relief Act of 2012. The CBO estimated that letting current laws take effect beyond 2012 would significantly reduce future budget deficits. For example, the Bush tax cuts of 2001 and 2003 (extended by President Obama in 2010) were scheduled to expire at the end of 2012. Other deficit reducers per the CBO include: allowing the automatic spending cuts in the Budget Control Act of 2011 to take effect, allowing other tax cuts enacted in 2009 and 2010 by President Obama to expire in 2012, allowing the alternative minimum tax (AMT) to affect more taxpayers, and reducing Medicare reimbursements to doctors. These and other current laws, if allowed to take effect, reduce the deficit from an estimated 4.7% GDP in 2021 to 1.2% GDP. Total deficit reduction could be as high as $7.1 trillion over a decade if current law is enforced and not overridden. U.S. Federal budget deficit as % GDP assuming continuation of certain policies 2011-2021. The "fiscal cliff" and "sequester"
Economist Paul Krugman argued in December 2012 that there is no short-run fiscal crisis and the emphasis should be on job creation. He warns that a well-financed lobby of "deficit scolds" have created a phony deficit crisis when the government should be spending more to put people to work. He pointed out that the U.S. cannot default because it can print money and that interest rates on government debt are very low, allowing the government to borrow easily. The main risk of fiscal profligacy would be inflation, which might actually help as a devalued dollar would make exports more competitive. Economist Michael Spence analyzed U.S. employment trends from 1990 to 2008, separating workforce components into internationally tradable and non-tradable industries. Nearly all job growth from 1990 to 2008 was in the non-tradable industries. These trends are correlated with increasing income inequality and indicate significant structural issues face the U.S. labor market. Economist Raghuram Rajan wrote in May 2012 that the U.S. economy was not on a sustainable path pre-crisis and that fiscal and monetary stimulus may not be effective solutions. More long-term measures will be required to make workers more competitive: "Sensible policy lies in improving the capabilities of the workforce across the country, so that they can get sustainable jobs with steady incomes." He also advocated mortgage principal reduction to relieve household debt burdens. Economists Joseph Stiglitz and Mark Zandi both advocated significant mortgage refinancing or write-downs during August 2012 to help provide an economic boost, as over 13 million homeowners are underwater on their homes, which affects their ability to consume. Economist Amir Sufi at the University of Chicago argued in July 2011 that a high level of household debt is a major factor holding back the economy. His research indicates that areas of the country with lower household debt levels have recovered more quickly from the economic downturn. He advocates mortgage write-downs and other debt reduction ideas. Economists Lawrence Summers and Christina D. Romer wrote in April 2012 that larger budget deficits today to stimulate the economy can be coupled with austerity measures that phase in gradually. For example, laws could be passed today funding investments in infrastructure to stimulate the economy today while raising the retirement age and raising taxes over time. Former OMB Director Peter Orszag wrote in May 2012: "When policy makers put in place measures carefully designed to reduce the federal deficit in the future, most of them happen...enacting more stimulus today and more deficit reduction to take effect later is exactly what the U.S. needs." 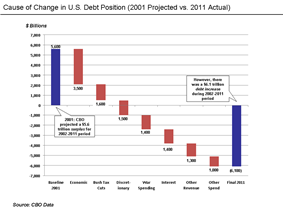 One of the debates facing the U.S. and Europe during 2012 relates to choices between deficit reduction ("austerity") and running larger budget deficits (via higher spending and tax cuts) to encourage economic growth and employment. Several European countries that implemented austerity policies via government cost reductions and higher taxes during 2010-2011 have initially experienced slowing economies, as predicted by Keynesian economics. Economic growth and employment are key factors driving recent deficits. The Congressional Budget Office (CBO) estimated in October 2011 that approximately one-third of the deficit projected for fiscal year 2012 was due to economic factors, which have caused safety net expenditures to increase and tax revenues to decline with high unemployment. Political realities make major budgetary deals difficult to achieve. While Republicans argue conceptually for reductions in Medicare and Social Security, they are hesitant to actually vote to reduce the benefits from these popular programs. Democrats on the other hand argue conceptually for tax increases on the wealthy, yet may be hesitant to vote for them because of the effect on campaign donations from the wealthy. The so-called budgetary "grand bargain" of tax hikes on the rich and removal of some popular tax deductions in exchange for reductions to Medicare and Social Security is therefore elusive. Many of the debates surrounding the United States federal budget center around competing macroeconomic schools of thought. In general, Democrats favor the principles of Keynesian economics to encourage economic growth via a mixed economy of both private and public enterprise, a welfare state, and strong regulatory oversight. Conversely, Republicans generally support applying the principles of either laissez-faire or supply-side economics to grow the economy via small government, low taxes, limited regulation, and free enterprise. Debates have surrounded the appropriate size and role of the federal government since the founding of the country. These debates also deal with questions of morality, income equality and intergenerational equity. For example, Congress adding to the debt today may or may not enhance the quality of life for future generations, who must also bear the additional interest and taxation burden. Topics frequently in the news in the 2010-2012 time period included: a) the austerity versus stimulus debate; b) the fiscal cliff including the effects of the Bush tax cuts and related extension; c) causes of deficit and debt increases; and d) the effects of healthcare reform on the budget. CBO reported in September 2011: "The nation cannot continue to sustain the spending programs and policies of the past with the tax revenues it has been accustomed to paying. Citizens will either have to pay more for their government, accept less in government services and benefits, or both." 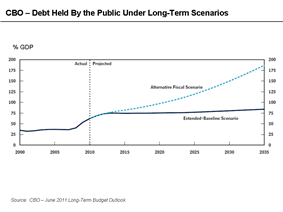 CBO estimated under the baseline scenario that the U.S. debt held by the public would increase approximately $8.5 trillion between the end of 2014 and 2024. Under a $2 trillion deficit reduction scenario during that first decade, federal debt held by the public in 2039 would stand at 75 percent of GDP, only slightly above the value of 72 percent at the end of 2013. Under a $4 trillion deficit reduction scenario for that decade, federal debt held by the public would fall to 42 percent of GDP in 2039. By comparison, such debt was 35 percent of GDP in 2007 and has averaged 39 percent of GDP during the past 40 years. Over the long-term, CBO projects that interest expense and mandatory spending categories (e.g., Medicare, Medicaid and Social Security) will continue to grow relative to GDP, while discretionary categories (e.g., Defense and other Cabinet Departments) continue to fall relative to GDP. 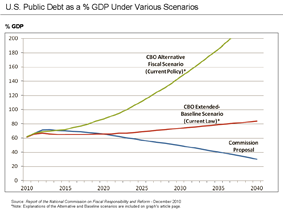 Debt is projected to continue rising relative to GDP under the above two scenarios, although the CBO did also offer other scenarios that involved austerity measures that would bring the debt to GDP ratio down. The "extended alternative fiscal scenario" assumes the continuation of present trends, which result in a more unfavorable debt position and adverse economic consequences relative to the baseline scenario. CBO reported in July 2014 that under this scenario: "[C]ertain policies that are now in place but are scheduled to change under current law are assumed to continue, and some provisions of current law that might be difficult to sustain for a long period are assumed to be modified. Under that scenario, deficits excluding interest payments would be about $2 trillion larger over the first decade than those under the baseline; subsequently, such deficits would be larger than those under the extended baseline by rapidly increasing amounts, doubling as a percentage of GDP in less than 10 years. 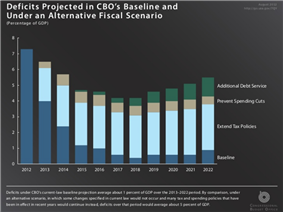 CBO projects that real GNP in 2039 would be about 5 percent lower under the extended alternative fiscal scenario than under the extended baseline with economic feedback, and that interest rates would be about three-quarters of a percentage point higher. Reflecting the budgetary effects of those economic developments, federal debt would rise to 183 percent of GDP in 2039." The "extended baseline scenario" assumes that the laws currently on the books will be implemented, for the most part. CBO reported in July 2014 that under this scenario: "If current laws remained generally unchanged in the future, federal debt held by the public would decline slightly relative to GDP over the next few years. After that, however, growing budget deficits would push debt back to and above its current high level. Twenty-five years from now, in 2039, federal debt held by the public would exceed 100 percent of GDP. Moreover, debt would be on an upward path relative to the size of the economy, a trend that could not be sustained indefinitely. By 2039, the deficit would equal 6.5 percent of GDP, larger than in any year between 1947 and 2008, and federal debt held by the public would reach 106 percent of GDP, more than in any year except 1946—even without factoring in the economic effects of growing debt." The Congressional Budget Office (CBO) reports its Long-Term Budget Outlook annually, providing at least two scenarios for spending, revenue, deficits, and debt. The 2014 Outlook mainly covers the 25 year period through 2039. CBO reported in its February 2014 Budget and Economic Outlook (which covers the 2014-2024 period) that deficits were projected to return to approximately the historical average relative to the size of the economy (GDP) by 2014. CBO estimated that under current law, the deficit would total $514 billion in fiscal year 2014 or 3.0% GDP. Deficits would then slowly begin rising again through 2024 due primarily to the pressures of an aging population and rising healthcare costs per person. The debt to GDP ratio would remain stable for much of the decade then begin rising again toward the end of the 10-year forecast window, from 74% in 2014 to 79% in 2024. CBO reported in October 2014: "The federal government ran a budget deficit of $486 billion in fiscal year 2014...$195 billion less than the shortfall recorded in fiscal year 2013, and the smallest deficit recorded since 2008. Relative to the size of the economy, that deficit—at an estimated 2.8 percent of gross domestic product (GDP)—was slightly below the average experienced over the past 40 years, and 2014 was the fifth consecutive year in which the deficit declined as a percentage of GDP since peaking at 9.8 percent in 2009. By CBO's estimate, revenues were about 9 percent higher and outlays were about 1 percent higher in 2014 than they were in the previous fiscal year." Economist Paul Krugman also explained in December 2011 the causes of the sizable shift from private sector deficit to surplus: "This huge move into surplus reflects the end of the housing bubble, a sharp rise in household saving, and a slump in business investment due to lack of customers." Wolf argued that the sudden shift in the private sector from deficit to surplus due to the global economic crisis forced the government balance into deficit, writing: "The financial balance of the private sector shifted towards surplus by the almost unbelievable cumulative total of 11.2 per cent of gross domestic product between the third quarter of 2007 and the second quarter of 2009, which was when the financial deficit of US government (federal and state) reached its peak...No fiscal policy changes explain the collapse into massive fiscal deficit between 2007 and 2009, because there was none of any importance. The collapse is explained by the massive shift of the private sector from financial deficit into surplus or, in other words, from boom to bust." Economist Martin Wolf explained in July 2012 that government fiscal balance is one of three major financial sectoral balances in the U.S. economy, the others being the foreign financial sector and the private financial sector. The sum of the surpluses or deficits across these three sectors must be zero by definition. Since the foreign and private sectors are in surplus, the government sector must be in deficit. 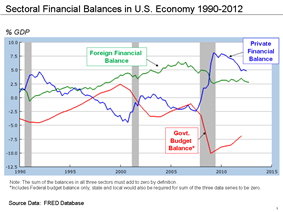 Sectoral financial balances in U.S. economy 1990-2012. By definition, the three balances must net to zero. Since 2009, the U.S. capital surplus and private sector surplus have driven a government budget deficit. However, since mid to late 2010, the U.S. Treasury has been obtaining negative real interest rates at Treasury security auctions. At such low rates, government debt borrowing saves taxpayer money according to one economist. There is no guarantee that such rates will continue, but the trend has remained falling or flat as of October 2012. The total federal debt is divided into "debt held by the public" and "intra-governmental debt." The debt held by the public refers to U.S. government securities or other obligations held by investors (e.g., bonds, bills and notes), while Social Security and other federal trust funds are part of the intra-governmental debt. As of September 30, 2012 the total debt was $16.1 trillion, with debt held by the public of $11.3 trillion and intragovernmental debt of $4.8 trillion. Debt held by the public as a percentage of GDP rose from 34.7% in 2000 to 40.3% in 2008 and 70.0% in 2012. U.S. GDP was approximately $15 trillion during 2011 and an estimated $15.6 trillion for 2012 based on activity during the first two quarters. This means the total debt is roughly the size of GDP. Economists debate the level of debt relative to GDP that signals a "red line" or dangerous level, or if any such level exists. By comparison, China's budget deficit was 1.6% of its $10 trillion GDP in 2010, with a debt to GDP ratio of 16%. Intuitively, the annual budget deficit should represent the amount added to the national debt. However, there are certain types of spending ("supplemental appropriations") outside the budget process which are not captured in the deficit computation, which also add to the national debt. 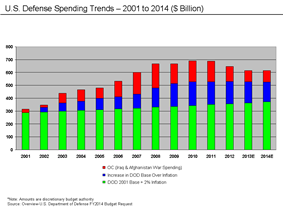 Prior to 2009, spending for the wars in Iraq and Afghanistan was often funded through special appropriations excluded from the budget deficit calculation. 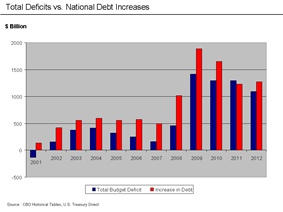 In FY2010 and prior, the budget deficit and annual change in the national debt were significantly different. For example, the U.S. added $1 trillion to the national debt in FY2008 but reported a deficit of $455 billion. Due to rules changes implemented under President Obama in 2009, the two figures have moved closer together and were nearly identical in 2013. Deficit and Debt Increases 2001-2013. CBO reported that net interest on the public debt was approximately $223 billion in FY2012 (6.3% of spending), down from $230 billion in FY2011. During FY2012, the GAO reported a figure of $245 billion, down from $251 billion. Government also accrued a non-cash interest expense of $187 billion for intra-governmental debt, primarily the Social Security Trust Fund, for a total interest expense of $432 billion. GAO reported that even though the national debt rose in FY2012, the interest rate paid declined. Should interest rates rise to historical averages, the interest cost would increase dramatically. Historian Niall Ferguson described the risk that foreign investors would demand higher interest rates as the U.S. debt levels increase over time in a November 2009 interview. 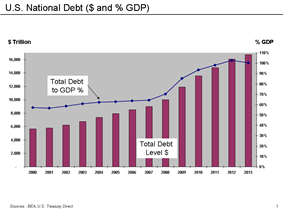 As of January 2012, public debt owned by foreigners has increased to approximately 50% of the total or approximately $5.0 trillion. As a result, nearly 50% of the interest payments are now leaving the country, which is different from past years when interest was paid to U.S. citizens holding the public debt. Interest expenses are projected to grow dramatically as the U.S. debt increases and interest rates rise from very low levels to more typical historical levels. Military spending: The military budget of the United States during FY 2012 was approximately $651 billion in expenses for the Department of Defense (DoD), $124 billion for the Department of Veterans Affairs, and $47 billion for the Department of Homeland Security, for a total of $822 billion. This was approximately $28 billion or 3.3% below 2011 spending. The U.S. defense budget (excluding spending for the wars in Iraq and Afghanistan, Homeland Security, and Veteran's Affairs) is around 4% of GDP. Adding these other costs places defense spending around 5% GDP. The DoD baseline budget, excluding supplemental funding for the wars, grew from $297 billion in FY2001 to a budgeted $534 billion for FY2010, an 81% increase. According to the CBO, defense spending grew 9% annually on average from fiscal year 2000-2009. Much of the costs for the wars in Iraq and Afghanistan have not been funded through regular appropriations bills, but through emergency supplemental appropriations bills. As such, most of these expenses were not included in the budget deficit calculation prior to FY2010. Some budget experts argue that emergency supplemental appropriations bills do not receive the same level of legislative care as regular appropriations bills. During 2011, the U.S. spent more on its military budget than the next 13 countries combined. Non-defense discretionary spending is used to fund the executive departments (e.g., the Department of Education) and independent agencies (e.g., the Environmental Protection Agency), although these do receive a smaller amount of mandatory funding as well. Discretionary budget authority is established annually by Congress, as opposed to mandatory spending that is required by laws that span multiple years, such as Social Security or Medicare. The federal government spent approximately $615 billion during 2012 on the Cabinet Departments and Agencies, excluding the Department of Defense, representing 17% of budgeted expenditures or about 4.0% of GDP. Social Security is a social insurance program officially called "Old-Age, Survivors, and Disability Insurance" (OASDI), in reference to its three components. It is primarily funded through a dedicated payroll tax of 12.4%. During 2013, total benefits of $808 billion were paid out versus $768 billion in 2012, an increase of $40 billion or 5.2%. Social Security’s total expenditures have exceeded its non-interest income since 2010. The deficit of non-interest income relative to cost was about $49 billion in 2010, $45 billion in 2011, and $55 billion in 2012. During 2010, an estimated 157 million people paid into the program and 54 million received benefits, roughly 2.91 workers per beneficiary. Since the Greenspan Commission in the early 1980s, Social Security has cumulatively collected far more in payroll taxes dedicated to the program than it has paid out to recipients—nearly $2.6 trillion in 2010. This annual surplus is credited to Social Security trust funds that hold special non-marketable Treasury securities. This surplus amount is commonly referred to as the "Social Security Trust Fund". The proceeds are paid into the U.S. Treasury where they may be used for other government purposes. 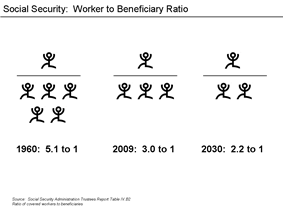 Social Security spending will increase sharply over the next decades, largely due to the retirement of the baby boom generation. The number of program recipients is expected to increase from 44 million in 2010 to 73 million in 2030. Program spending is projected to rise from 4.8% of GDP in 2010 to 5.9% of GDP by 2030, where it will stabilize. The Social Security Administration projects that an increase in payroll taxes equivalent to 1.8% of the payroll tax base or 0.6% of GDP would be necessary to put the Social Security program in fiscal balance for the next 75 years. Over an infinite time horizon, these shortfalls average 3.3% of the payroll tax base and 1.2% of GDP. Various reforms have been debated for Social Security. Examples include reducing future annual cost of living adjustments (COLA) provided to recipients, raising the retirement age, and raising the income limit subject to the payroll tax ($106,800 in 2009). Because of the mandatory nature of the program and large accumulated surplus in the Social Security Trust Fund, the Social Security system has the legal authority to compel the government to borrow to pay all promised benefits through 2036, when the Trust Fund is expected to be exhausted. Thereafter, the program under current law will pay approximately 75%–78% of promised benefits for the remainder of the century. Note: CBO estimates that policy changes with a 0.6% of GDP annual impact are sufficient to address the 75-year program shortfall. Abbreviations are explained in the chart page. Source: CBO Report-July 2010. Medicare was established in 1965 and expanded thereafter. Spending for Medicare during 2013 was $585 billion. In 2009, the program covered an estimated 45 million persons (38 million aged and 7 million disabled). It consists of four distinct parts which are funded differently: Hospital Insurance, mainly funded by a dedicated payroll tax of 2.9% of earnings, shared equally between employers and workers; Supplementary Medical Insurance, funded through beneficiary premiums (set at 25% of estimated program costs for the aged) and general revenues (the remaining amount, approximately 75%); Medicare Advantage, a private plan option for beneficiaries, funded through the Hospital Insurance and Supplementary Medical Insurance trust funds; and the "Part D" prescription drug benefits, for which funding is included in the Supplementary Medical Insurance trust fund and is financed through beneficiary premiums (about 25%) and general revenues (about 75%). Spending on Medicare and Medicaid is projected to grow dramatically in coming decades. The number of persons enrolled in Medicare is expected to increase from 47 million in 2010 to 80 million by 2030. While the same demographic trends that affect Social Security also affect Medicare, rapidly rising medical prices appear to be a more important cause of projected spending increases. CBO expects Medicare and Medicaid to continue growing, rising from 5.3% GDP in 2009 to 10.0% in 2035 and 19.0% by 2082. CBO has indicated healthcare spending per beneficiary is the primary long-term fiscal challenge. Various reform strategies were proposed for healthcare, and in March 2010, the Patient Protection and Affordable Care Act was enacted as a means of health care reform. CBO reduced its per capita Medicare spending assumptions by $1,000 for 2014 and $2,300 for 2019, relative to its 2010 estimate for those years. If this trend continues, it will significantly improve the long-term budget outlook. 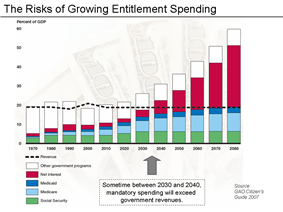 Mandatory spending is expected to continue increasing as a share of GDP. This is due in part to demographic trends, as the number of workers continues declining relative to those receiving benefits. For example, the number of workers per retiree was 5.1 in 1960; this declined to 3.0 in 2010 and is projected to decline to 2.2 by 2030. These programs are also affected by per-person costs, which are also expected to increase at a rate significantly higher than the economy. This unfavorable combination of demographics and per-capita rate increases is expected to drive both Social Security and Medicare into large deficits during the 21st century. Unless these long-term fiscal imbalances are addressed by reforms to these programs, raising taxes or drastic cuts in discretionary programs, the federal government will at some point be unable to pay its obligations without significant risk to the value of the dollar (inflation). Social Security, Medicare, and Medicaid expenditures are funded by more permanent Congressional appropriations and so are considered mandatory spending. Social Security and Medicare are sometimes called "entitlements," because people meeting relevant eligibility requirements are legally entitled to benefits, although most pay taxes into these programs throughout their working lives. Some programs, such as Food Stamps, are appropriated entitlements. Some mandatory spending, such as Congressional salaries, is not part of any entitlement program. Mandatory spending accounted for 57.4% of total federal outlays in FY2012, with net interest payments accounting for an additional 6.3%. In 2000, these were 53.2% and 12.5%, respectively. 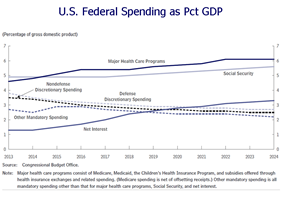 CBO projects that spending for Social Security, Healthcare programs and interest costs will rise relative to GDP over the 2014-2024 period, while defense and other discretionary spending will decline relative to GDP. Expenditures are classified as mandatory, with payments required by specific laws, or discretionary, with payment amounts renewed annually as part of the budget process. Expenditures averaged 20.4% GDP over the past 40 years, generally ranging +/-2% GDP from that level. The 2013 spend was 20.8% GDP, versus 2012 spend of 22.0% GDP. During FY 2013, the federal government spent $3.5 trillion on a budget or cash basis, down $84 billion or 2.4% vs. FY 2012 spending of $3.54 trillion. 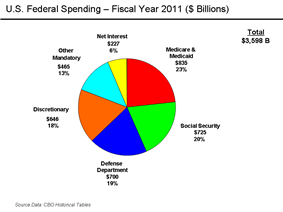 Major categories of FY 2013 spending included: Social Security ($803B or 23% of spending), Medicare & Medicaid ($760B or 22%), Defense Department ($608B or 18%), and interest($259B or 7%). Healthcare and Social Security spending increased $81B (5.5%) versus 2012, while Defense spending fell $47B (7.2%). In November 2009, The Economist estimated the additional federal tax revenue generated from eliminating certain tax expenditures, for the 2013–2014 period. These included: income exemptions for employer-provided health insurance ($215 billion); and various income deductions such as mortgage interest ($147B), state & local taxes ($65B), capital gains on homes ($60B), property taxes ($33B) and municipal bond interest ($37B). This subset totals $557 billion. The Congressional Joint Committee on Taxation estimated in 2008 the amount of federal tax expenditures for the five year (2008–2012) period. The term "tax expenditures" refers to income exemptions or deductions that reduce the tax collections that would be made applying a particular tax rate alone. According to the Center for American Progress, annual tax expenditures have increased from $526 billion in 1982 to $1,025 billion in 2010, adjusted for inflation (measured in 2010 dollars). Economist Mark Zandi wrote in July 2011 that tax expenditures should be considered a form of government spending. 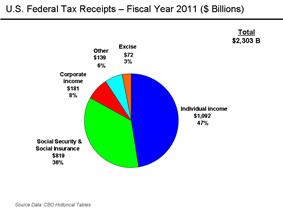 The federal payroll tax (FICA) which partially funds Social Security and Medicare was a flat tax until 2013. It is now a progressive tax. For the Social Security portion, employers and employees each pay 6.2% of the workers gross pay, a total of 12.4%. The Social Security portion is capped at $113,700 for 2013, meaning income above this amount is not subject to the tax. The Medicare portion is also paid by employer and employee each at 1.45% and is not capped. Starting in 2013, an additional 0.9 percent more in Medicare taxes was applied to income of more than $200,000 ($250,000 for married couples filing jointly). For calendar years 2011 and 2012, the employee's portion of the payroll tax was reduced to 4.2% as an economic stimulus measure; this expired for 2013. The federal personal income tax is  The American Taxpayer Relief Act of 2012 raised the income tax rates for individuals earning over $400,000 and couples over $450,000. There are numerous exemptions and deductions, that typically result in a range of 35-40% of U.S. households owing no federal income tax. The recession and tax cut stimulus measures increased this to 51% for 2009, versus 38% in 2007. Revenue and Expense as % GDP. FY2013 revenues were 16.7% GDP, versus 15.2% GDP in FY2012. Tax revenues averaged approximately 18.3% of gross domestic product (GDP) over the 1970-2009 period, generally ranging plus or minus 2% from that level. Tax revenues are significantly affected by the economy. Recessions typically reduce government tax collections as economic activity slows. For example, tax revenues declined from $2.5 trillion in 2008 to $2.1 trillion in 2009, and remained at that level in 2010. From 2008 to 2009, individual income taxes declined 20%, while corporate taxes declined 50%. At 15.1% of GDP, the 2009 and 2010 collections were the lowest level of the past 50 years. During FY2013, the federal government collected approximately $2.77 trillion in tax revenue, up $326 billion or 13% versus FY2012 revenues of $2.45 trillion. Primary receipt categories included individual income taxes ($1,316B or 47%), Social Security/Social Insurance taxes ($948B or 34%), and corporate taxes ($274B or 10%). Other revenue types included excise, estate and gift taxes. Revenues rose across all categories in FY2013 versus FY2012 as tax cuts expired and the economy improved. The sooner austerity steps are taken (e.g., raising revenues or reducing spending or a combination of both), the smaller those changes can be to maintain or reduce the debt level projected in 2039. For example, under the baseline scenario, stabilizing the ratio of debt to GDP at 74% (its current level) would require non-interest spending cuts and/or tax hikes of 1.2% of GDP annually if implemented in 2015, or 1.5% of GDP annually if begun in 2020. To bring the debt to GDP ratio back to its 40-year average of 39%, the austerity measures required would be 2.6% GDP if begun in 2015 and 3.2% GDP if begun in 2020. 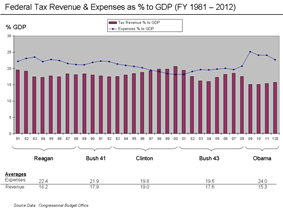 Over the 1974 to 2013 period, federal spending averaged 20.5% GDP and revenue 17.4% GDP. For scale, a 2% GDP reduction in spending would be approximately a 10% spending cut. The Congressional Budget Office (CBO) projects budget data such as revenues, expenses, deficits, and debt as part of its "Long-term Budget Outlook" which is released annually. The 2014 Outlook included projections for debt through 2039 and beyond. CBO outlined several scenarios that result in a range of outcomes. The "Extended Baseline" scenario and "Extended Alternative Fiscal" scenario both result in a much higher level of debt relative to the size of the economy (GDP) as the country ages and healthcare costs rise faster than the rate of economic growth. CBO also identified scenarios involving significant austerity measures, which maintain or reduce the debt relative to GDP over time. Historical tables within the President's Budget (OMB) provide a wide range of data on federal government finances. Many of the data series begin in 1940 and include estimates of the President’s Budget for 2009–2014. Additionally, Table 1.1 provides data on receipts, outlays, and surpluses or deficits for 1901–1939 and for earlier multi-year periods. This document is composed of 17 sections, each of which has one or more tables. Each section covers a common theme. Section 1, for example, provides an overview of the budget and off-budget totals; Section 2 provides tables on receipts by source; and Section 3 shows outlays by function. When a section contains several tables, the general rule is to start with tables showing the broadest overview data and then work down to more detailed tables. The purpose of these tables is to present a broad range of historical budgetary data in one convenient reference source and to provide relevant comparisons likely to be most useful. The most common comparisons are in terms of proportions (e.g., each major receipt category as a percentage of total receipts and of the gross domestic product).